A visual odyssey that will change the way we see our planet, this remarkable book, companion to the acclaimed Discovery Channel/ BBC series, is an enduring and awe-inspiring record of one of the most ambitious natural history projects ever undertaken. Using the latest aerial surveillance, state-of-the-art cameras, and high definition technology, the creators of Planet Earth have assembled more than 400 stunning photographs of wondrous natural landscapes from around the globe, including incredible footage of the rarely spotted, almost mythical creatures that live in these habitats. Many of the images reveal inaccessible places that few have seen and record animal behavior that has never been filmed or photographed before. With the help of this highly advanced technology and the world's premier wildlife photographers, the book takes us on a spectacular journey from the world's greatest rivers and impressive gorges, to its mightiest mountains, hidden caves and caverns, and vast deserts. 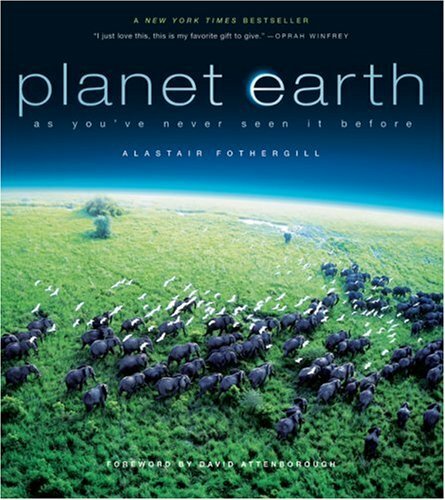 Planet Earth captures breathtaking sequences of predators and their prey, lush vistas of forests viewed from the tops of towering trees, the oceans and their mysterious creatures viewed from beneath the surface, and much more-in a magnificent adventure that brings unknown wonders of the natural world into our living rooms.